It may seem like a long time ago now but bloggers are much like squirrels and we've been mostly asleep/burying nuts under trees since the end of September. (This sounds like a lie - Ed). Which is why you haven't seen a write-up of the fantastic fundraising gig organised by our very own T-Wrecks and hosted by Audio. Until now. Event poster, created by Jess E Ska. First up was Jonzip, described on his website as a "solo acoustic punk". He was in 70s punk band, The Zips, and has recently struck out on his own with folk/punk/protest music and we were in for a treat. Jonzip on stage with Jess E Ska. He was followed by The Superlatives, who are made up of three guys from Wetherby and play music with obvious punk/indie/alternatives influences. Full of energy, they grabbed the attention and didn't let it drop for a second! And last but not least were Glaswegian nine-piece ska collective, Esperanza. Featuring ex-GRD skater Jess E Ska, they soon had everyone up dancing and by the end no-one wanted it to be over. I'm fairly certain I've expended less energy during intense gym sessions than some of those skanking, pogoing and generally throwing themselves about! The event raised over £300. We would like to thank the venue, the bands, everyone who came along and had a wonderful time and everyone else involved in making it such a success! If this has whetted your appetite for more Home Teams action, why not come along on 12th November to see the T-Wrecks face up to the Bad Omens in our Home Teams Final?! Tickets and more info here. Game poster for Home Teams 2, 2016. You might remember the first event in this year's GRD Home Teams calendar, back in June. The T-Wrecks took on the Bad Omens and Death Stars and those giant green guys with pointy teeth and tiny arms were victorious! Twice! Turns out being extinct for several million years is no barrier to being successful at roller derby. If you want all the prehistoric detail, check out the blog. The end of September saw the Bad Omens and the Death Stars finally getting their chance to fight it out, to see whether magical powers and brooms or lightsabers and something which definitely isn't a moon were the best. Fever showing Postlewaight her magical flying smashy roller derby powers; photo courtesy of Dave McAleavy boutday.com. It was a pretty tense game, with a tight margin between the teams throughout and multiple lead changes to keep the crowd on the edge of their seats. At half time, there were only five points in it with Death Stars in the lead 102-107. Monifa, Belle & Lawless holding back Hadrian's Brawl; photo courtesy of Dave McAleavy boutday.com. While the Force was strong with our local Sith Lords, any portents of doom for the Bad Omens would have been premature. They appeared to cast a spell over the opposition and created gold from base metal - finishing the game as diabolically good winners. Final score: Bad Omens 236 - 227 Death Stars. Despite spending much of the game reclining, the Bad Omens still romped to victory; photo courtesy of Dave McAleavy boutday.com. The final event in our home teams' season this year will be on November 12th, with a game between the Bad Omens and T-Wrecks to see who will bathe in glory and who will bathe in gravy (or something). Get your tickets here. I'm not referring to your dad's dodgy record collection or a jurassic party game, instead an event happening this very Saturday evening! If you pop along to Audio at 7pm, you'll be in for a treat as our T-Wrecks have organised a fundraising gig featuring Glaswegian nine-piece ska collective Esperanza, The Superlatives and solo acoustic punk Jonzip. For more info and ticket details, go here. And if you're free earlier in the day why not come along for some more tense home teams action as last year's overall winners the Bad Omens take on the Death Stars to see who will get through to the Home Teams Season Final in November! Check out our website for more details and to see the package deal we have for game+gig tickets! The last outing for our home teams was in November, so they were well overdue an airing on Saturday! The first event in this year's home teams calendar saw the T-Wrecks taking on last year's champions, the Bad Omens, followed by the Death Stars. Lightsabers were dusted off, dinosaur masks acquired and the Omens practised their best crow impressions - there's nothing like a bit of intraleague rivalry! The poster for the Home Teams Season Opener - photos courtesy of Dave McAleavy. Taking to the track for the first time in a public game were Nitrojen for the T-Wrecks, and Katie Toerag, Sarah McGettigan, Spin Diesel and Tesla Recoil for the Bad Omens - they all did some spectacular things and we're proud of them all! We were also glad to welcome some guest skaters from Ayrshire Roller Derby for the first game: Bambo and R2-Deck You, skating for the T-Wrecks. 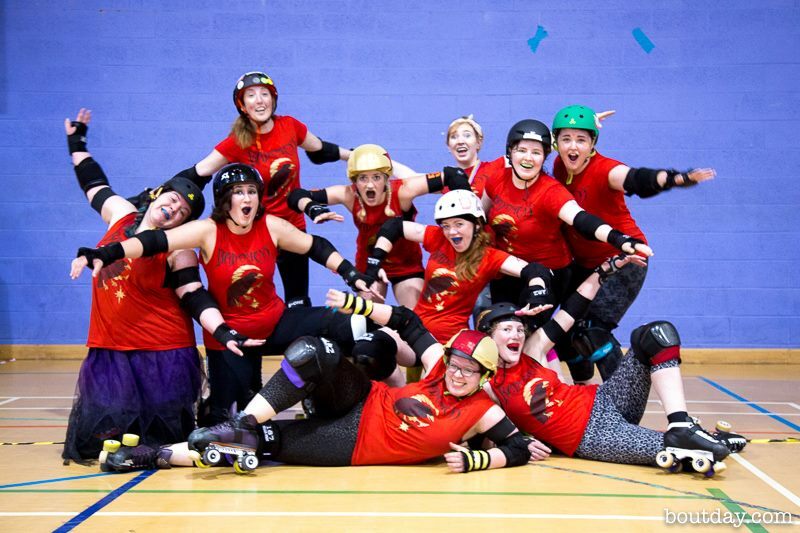 Also playing was the T-Wrecks' Rosalind Cracklin' who started fresh meat with GRD and now divides her time between Glasgow and Tel Aviv where she was integral to the set-up of their league! Last year's winners the Bad Omens took an early lead, with the score at 18-23 in their favour after the first jam. They maintained their dominance until jam 4, when a fabulous effort from Sarah McMillan stacked on points for the T-Wrecks, resulting in a lead change ending the jam with the score 50-42. Six jams in, the T-Wrecks maintained their lead 69-46 and in jam 7 Bambo took full advantage of a power jam to take the score to 83-46 with up to three Bad Omens in the penalty box at various points during the jam. TW co-captain Jeneral Strike scored quickly in jam 9 and then called it, taking the scores to 91-46 and in jam 11 one of our newbies, Nitrojen, donned the star for a power jam and fought hard against tough opposition to squeeze out some points leaving the scores at 103-50. Shorty McLightning Pants jamming for the Bad Omens in jam 13 clearly did not suffer triskaidekaphobia and took lead jammer over Puma Thurman, got the points and called it to leave the half time score 107-70 to the T-Wrecks, despite a lovely spin noted by the commentators from Puma. Tyrannosaurus Wrecks' guest Bambo showing off her jamming skills against the Bad Omens. Jam 10 saw some fresh blood lining up to jam with Penny Pinch'er for the Omens and Mad Natter for the T-Wrecks featuring on the jam line - 28 seconds later it was all over 205-85. One of our guests, R2-Deck You, took a jam against Shorty for number eleven; Shorty got lead and took advantage of it for an impressive thirty points, breaking the 100-point barrier - 205-115. The following jam started with Puma Thurman and Penny Pinch'er with the stars - Puma took lead and gained fifteen points while Penny passed the star to BO captain Janie Bones; the jam ended 220-115. Some malign Bad Omens influence made the next jam (number 13, again) the last one of the game and saw Spin Diesel against Rosalind Cracklin' (in hilarious niche feminist/science jokes, my note-taker for the game has documented this as Spin vs Watson & Crick). Thanks to the bench staff for all their support: Beav Aggressive as LUM/bench manager for Bad Omens, and LUM Maw Deuce with bench manager Submarine for T-Wrecks. After a short break, the T-Wrecks were lining up again to face the fresh-faced, well-rested Death Stars and their evil Sith powers. Sarah McGettigan and Spin Diesel switched from the Bad Omens to guest for the T-Wrecks and the Death Stars had Bad Manders, Five Star Sylk, Roller Dobby, Sin Binner and Stripey guesting from Mean City Roller Derby. The Death Stars' talents are not restricted to skating; they possess some excellent cabaret skills too. A long time ago in a galaxy far far away, Marshall Lawless started off behind the jam line with TW co-captain Jeneral Strike; Lawless took the Death Stars to an early lead in jam 1 which ended 4-5 in favour of the Empire. The power of the dark side was evident again in jam 2, with Bruise Missile taking lead over Sarah McGettigan and calling it at 4-13. The third jam ended 7-13, and Sarah McMillan put some primordial pressure on the DS in jam 4 against Stripey; 11-13. The Death Stars pulled further ahead in jam 4 which finished 13-18 but the tide turned in favour of prehistory in jam 5: with Five Star Sylk sent to the bin, McGettigan seized lead for the TW and took full advantage of the power jam; lead change 38-18. The T-Wrecks' other guest Spin Diesel jammed next, against Bruise, and both scored points, taking it to 53-23. McMillan demonstrated the dominance of an apex predator in jam 8, ending at 62-23. Following an official review, Strike took on Bruise for a few points each: 66-27. In jam 10, Lawless came tantalisingly close to getting lead, but cut track and got sent to the penalty box leaving Spin free to take lead and score points - despite being accidentally blocked by her teammate Puma Thurman! 72-36. Another official review, which wasn't upheld, preceded jam 11 in which TW's Nitrojen was sent off and lead jammer Stripey was made to earn every last point, calling it at a palindromic 74-47. In jam 12, Sylk took the lead against McMillan - the crowd went wild, but she was only able to add one point to the Death Stars' total, leaving the scoreline 74-48. The following jam ended with no-one gaining points as Bruise took lead but was nearly overtaken by Strike forcing her to call it. Phoenix Fatale landed a punishing hit on McGettigan in jam 14; the latter was then taken backwards round the track by Lawless jamming for DS, leaving a lot of people uncertain as to where she should re-enter the track on her minus-one pass. The confusion ended with the half time score static at 74-48. Though the T-Wrecks maintained their lead for much of the first half, everyone was well aware that this could still be anyone's game with only 26 points between the teams. One good jam could change it all! McGettigan took the first jam of the half for TW against Bruise and was quickly sent off for a penalty. Bruise made it through the pack for lead jammer status, just as McGettigan re-entered the track, but was sent straight back off for cutting. 74-63. The dinosaurs started to feel the nerves as jam 2 opened as a power jam for Lawless who easily took lead - the TW star was passed to Strike and the jam ended 82-79. Another official review to keep the officials on their toes was followed by jam 3, with a cameo from DS captain Haberbashery wearing her team's star. She took the lead but was then sent to the bin for a penalty; Strike made the Death Stars pay in the power jam, which ended 97-80. Spin jammed in the fourth but was dominated by Sylk's defense, 110-101. Jam 5 was a power jam for McMillan who then cut track, leaving it open for Bruise to score an easy few for the Death Stars, but McMillan brought it back with an apex jump - 123-110. Sylk took the lead in jam 6 against Strike but called it quickly for zero points all round. McMillan faced guest skater Stripey in number seven and dominated for the dinosaurs, 133-112. Jam 8 took a while to warm up, with Lawless jamming for the DS eventually taking lead, but she was then overtaken by Strike who managed to score a few. 143-117. Strike jammed again in the ninth against Sylk; the former ended up in the penalty box but Sylk struggled to make her pay and the jam ended 143-118. Jam 10 then saw Bruise sent off early on for a back block, leaving a power jam for Puma who struggled against some awesome defense and was knocked off the inside twice and taken back. An exasperated Puma star passed to TW co-captain Shona Mercy who managed to score some; the jam ended 148-126. The Death Stars then called a team timeout, presumably to discuss whether or not the prequels should really be considered part of the Star Wars franchise or if we should just never talk about them again. The debate clearly re-energised Lawless, who blasted through the pack in jam 11 against McMillan, but was then contained by the T-Wrecks' defense and called it 157-135. Not wanting to feel left out, the T-Wrecks called a team timeout to consider the relative evolutionary disadvantage of having such tiny arms but concluded that size isn't everything. The twelfth and final jam of the game pitted Lawless against infrequent jammer Cara Viola - Lawless made it through first, but with a no-pass-no-penalty, leaving Cara to take lead jammer and, once time had expired, call off the jam for a T-Wrecks victory! They even just about managed to get all of the T-Wrecks in the same photo, without the use of a selfie stick! Just look how pleased they are at taking the win in both games. Thanks to the bench staff for all their support: LUM Scara-Leigh and bench manager Trucks Norris for the Death Stars and the T-Wrecks bench staff unchanged from the first game. Thanks as always to everyone who made today possible - referees, non-skating officials, photographers, volunteers, stall holders, EMTs and everyone else. And to the crowd who came along and showed their support for all of the teams: it was a lovely atmosphere and we all had such a wonderful time! 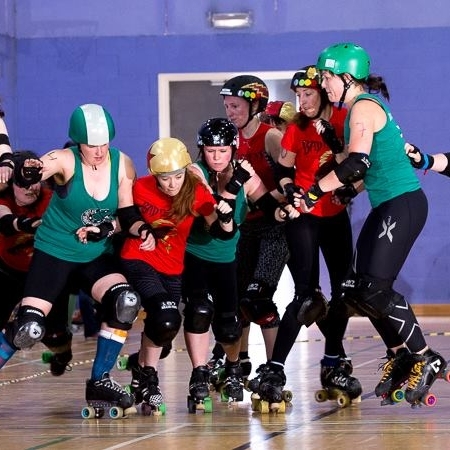 If that's whetted your appetite for EVEN MORE ROLLER DERBY, then keep an eye on our Events Page for more info on some Edinburgh-based fun in early August or some home games at the end of the same month. And if you've picked a side in the eternal battle between the home teams then you've got until the end of June to take advantage of the 10% discount off the relevant merch in our online store - and why not treat yourself to other GRD goodness while you're there?! For now, we're signing off for a well-earned fortnight of rest for the league - see you on the other side! #ThrowbackThursday: Home Teams Season 1! You're in for a treat this weekend: we're holding our first home teams games of the season on Saturday and you're all invited! The T-Wrecks will be lining up to face the Death Stars and the Bad Omens to see just what they can do with those tiny little arms against lightsabers and witchcraft. Tickets are £6 in advance from here or £8 on the door. As we prepare to open our 2016 Home Teams season I thought it'd be a good time to look back to five years ago when it all began. At that time we had the Irn Bruisers and the Maiden Grrders and we did play some intraleague games too, but late in 2010 an idea formed; we wanted to have a public tournament to showcase our skills and get a little bit of competition going within the league. There were three teams to begin with: Bad Omens, Death Stars and Hell's Belles. The Tyrannosaurus Wrecks first featured in the 2013 Home Teams season (it takes significantly longer to reanimate a dinosaur than it does to attract the attention of The Empire or to summon demons and witches apparently). GRD's Bad Omens, Death Stars, Hell's Belles and Tyrannosaurus Wrecks - which one is your favourite? The first Home Teams season began on 19 February 2011, and the final was contested on May 7th. This saw the Death Stars facing up to the Bad Omens - they had both beaten the Hell's Belles and seemed evenly matched. It was difficult to predict whether the malevolent Sith powers would prove a match for some older women standing round a cauldron chanting about toil and trouble! 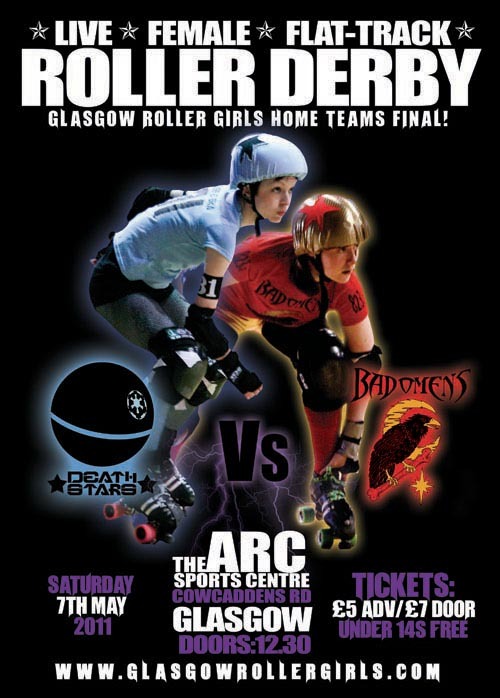 The poster for the first Home Teams Final, between the Death Stars and the Bad Omens, featuring Jess E Ska & Cara VIola. In the end the Dark Side was defeated and the misunderstood women took the win home in their oversized cooking pot to their cats: Death Stars 87 - 162 Bad Omens. But that's only part of the story - it remains to be decided who won the skateouts! Check out the video below. Yes, there's a choir. Yes, a certain Sith lord and his henchmen make an appearance. Yes, it is absolutely brilliant! Come along on Saturday for more silliness and roller derby, and if you want to show your support for your favourite team then there's a discount in our online store until the end of the month on home teams merch: use the code GRDHOMETEAMS at the checkout. Pick up something else nice for yourself while you're in there!